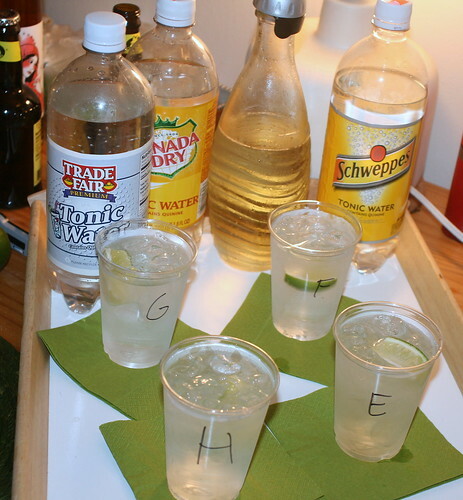 If you'll recall from our last installment, we're investigating tonic water and trying to figure out which one is best. We've settled on a method, lined up judges, and introduced our contenders. Joanna, being a bona fide college professor and certified Smart Person, suggested that we taste the G&Ts made with the premium tonics first, then the mass-markets, and then the syrups, so our palates wouldn't get confused or lulled by an orderly progression from least to most robust. So, how'd they do? Q Tonic: "Not dry dry, but a different quality from the others"; "Almost chalky -- it draws the moisture out of my mouth like a very dry white wine. Is it alkalinity that I'm tasting? Very delicate flavor"; "It doesn't jump out much; any bite I'm tasting is from the gin, not the tonic." Fentimans Tonic Water: "Odd dry-acid aftertaste, but not unpleasant. Lemony. "; "Quite dry -- not too acidic. Smooth and unobtrusive. "; "More quinine than [Q Tonic]." Fever-Tree Premium Indian Tonic Water: "Sweet, kind of bland. Not much there. Closest to tonic off the gun. "; "Citrusy, sweeter, but nicely balanced. More lime-y" than the others. "; "Way sweeter, but the most tonic-y. What I think of as tonic." Fever-Tree Mediterranean Tonic Water: "Longer flavor, lime-ier. "; "Very nice. The tonic flavor comes out fast, but doesn't linger. There's something almost herbal here. "; "This tonic plays better, and the tonic flavors are integrated with its other tastes." Sam chose Fever-Tree Mediterranean, then Fever-Tree Indian, then Q Tonic, then Fentimans. Joanna chose Fever-Tree Mediterranean, then Fentimans, then Fever-Tree Indian, then Q Tonic. Tony did exactly the same, and chose Fever-Tree Mediterranean, then Fentimans, then Fever-Tree Indian, then Q Tonic. He commented "My tonic should taste like tonic. If I want a gin and soda, I'll order it." Fever-Tree Mediterranean was the first-ranked by everyone and thus the clear winner. We were impressed by the different approaches taken by the various premium tonic brands -- they certainly didn't march in lockstep like the mass-market brands -- and surprised by how different they all were from each other, with varying botanicals, acid and bitterness levels, and sweetener choice. Working with cane sugar and agave nectar for sweetening was a definite help. Schweppes Tonic Water: "Swimming-pool chlorine flavor. Chemical. Burny. "; "Not as terrible as you describe...it's like gin & tonic next to a pool. This is doing a better imitation of a G&T. "; Terrible. Serious chemical taste, almost like cleanser." Canada Dry Tonic Water: "Not terrible. Very average, but not bad. "; "Not as terrible [as Sodastream.] Still a little fake tasting, but better balanced. It doesn't crush the gin, nor is it crushed by the gin, but it's one-note. "; "Better than [Schweppes or Sodastream]. I can only taste it in the top of the palate. With this G&T, I can only taste juniper when I exhale through my nose." 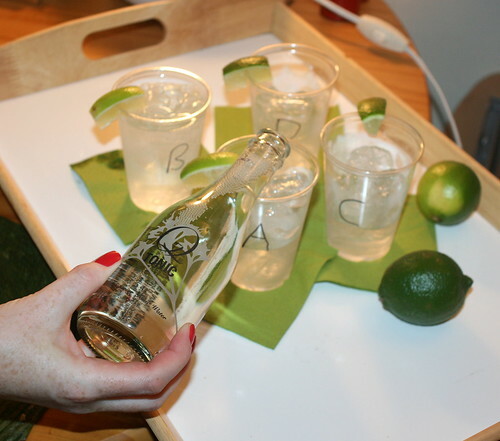 Trade Fair Premium Tonic Water: "There's not much there -- it makes gin less interesting. "; "I can't taste the gin. Really floral and soapy. "; "In this company, [Trade Fair] is the shining light." Sodastream Tonic Sodamix: "Big fake lemon + sugar flavor. "; "That tastes a lot more like chemicals. The tonic isn't working very hard; I can definitely taste the gin. It's like gin diluted with sugar water, but the sugar flavor is fake. "; "This just tastes like a glass of gin with ice. Except that it's got a very Splenda/Lemsip flavor to it." Sam chose Canada Dry, then Trade Fair, then Schweppes, then Sodastream. Tony chose Trade Fair, then Canada Dry, then Sodastream, then Schweppes. Jeffrey Morgenthaler's Tonic Syrup recipe: "Rich, big, voluptuous. A very nice balance of bitterness, darkness, & citrus. Best in Show. "; "I get ginger from this. Citrus and clove. Spicy. It doesn't taste a lot like a gin and tonic, but I like it a lot. It's herbal and assertive. Not classic, but very nice. Lovely. "; "I'm speechless. It's got Christmas-y spices, and a definite nutmeg-ish note." Toby Cecchini's Quinine Syrup recipe: "Acidic. Bright lemon/grapefruit. "; "Citrusy, but not a citric-acid flavor. Delicious, and mellower [than Morgenthaler's. ]"; "I get oranges from this. I really liked it." Tomr's Tonic: "Yum. I get ginger, bitterness, and astringency. Balanced, but with a heavy bitter edge. "; "Bitter. It starts a little fruity, then takes a left turn and crashes into a bitter wall. It's got a bark flavor and strong spice, and it may have overtaken [Cecchini's] in my ranking. "; "Bitter. I'd put it up with the top two [Morgenthaler's and Cecchini's.]" Bittermens Commonwealth Tonic Liqueur: "Very floral, with higher alcohol. I don't like it much, though, as it doesn't mesh with the gin. "; "Very bitter, and one-note bitter. It tastes like flowers gone bad. "; "Very floral, like a dandelion salad. The gin still exists in the glass, but not as much." UPDATE: Avery Glasser from Bittermens has been in touch, and asks if we perhaps goofed on the proportions, and mixed this G&T with as much as double the amount of Commonwealth that they recommend. This could easily be the case, and we will investigate, re-taste, and update our findings here ASAP. UPDATE ON THE UPDATE: We definitely goofed on the proportions -- apologies. We made another G&T, in the same kind of glass, using the same amount of ice and the preferred recipe on the Bittermens website. However, none of the three of us really liked this one too much either, although it was better than the original one we'd tasted. The floral notes weren't nearly as overwhelming as in the first one we'd made, but the correct one was still extremely bitter and we didn't think it played well with the gin. Fair enough; the website does say that they like their gin and tonics "very bitter, very dry", and this totally qualifies. We then tried their "very well balanced variant" on their preferred recipe, which replaces a quarter-ounce of the cordial with simple syrup: while this was much better -- the best of the three G&Ts with the Bittermens Commonwealth we tried -- and went down easier, our consensus was that it was still way too bitter and unbalanced. So if you like a really bitter G&T, the Commonwealth may be for you. We're not saying it's a bad product, but its flavor profile does skew extremely heavily in that particular direction. (I haven't had any of the other Bittermens Spirits line, though I really do want to try their New Orleans Coffee Liqueur with its chicory notes.) And of course, we love their line of bitters. Sam chose Jeffrey Morgenthaler's recipe, then Toby Cecchini's recipe, then Tomr's, then Bittermens. Joanna duplicated this exactly: first Jeffrey Morgenthaler's, then Toby Cecchini's, then Tomr's, then Bittermens. Tony switched up the first two and chose Toby Cecchini's, then Jeffrey Morgenthaler's, then Tomr's, then Bittermens. We were expecting strong flavors -- and strong opinions -- in this batch, and we certainly weren't disappointed. The idiosyncratic approaches to tonic syrups mean that they diverge wildly. As you'll see above, there were many mentions of Christmas spices such as clove and nutmeg; those particular spices weren't in the recipes, but judges were picking up on the allspice that was in both homemade syrups. (Toby Cecchini's syrup had the addition of cardamom and lavender as well.) The homemade syrups clearly beat the packaged syrup and the liqueur, and our wonderings about an alcoholic tonic water skewing the flavor were mostly unfounded. One nice thing about making your own syrup is that you can tweak the recipe; as Jeffrey Morgenthaler suggests, you could increase the orange peel if you'll be mixing it with a softer, citrus-y gin such as Plymouth. So: what have we learned here? Each of the three of us picked a Best in Show: Sam chose Jeffrey Morgenthaler's Tonic Syrup recipe. Tony picked Fever-Tree Mediterranean Tonic Water. And Joanna equivocated a bit between the two positions: "Fever-Tree Mediterranean is the best for what I understand a Gin & Tonic to be. But both the homemade syrups make delicious drinks." I think she's getting at something here: the syrups do represent a very different approach to a G&T than a traditional bottled tonic water, and a drinker's expectations have to enter into it somewhere as well. One thing we all agreed on, as Tony put it, was that "Big-brand tonic is crap. I am amazed at the gulf between the various premium brands and the mass-market ones." We expected the homemade syrups to do well, since the ingredients are fresh and the syrups don't need to have preservatives or be shelf-stable. But what we weren't expecting was a clear winner in the boutique tonic brands, the brand-new Fever-Tree Mediterranean Tonic Water. A surprise, since this tonic was designed to pair with vodka! So: what about this tonic makes it go well with vodka, blank canvas that it is, and why did we like it so much with gin? Does the rosemary in the tonic hook up with the juniper in the gin and make sweet piney love? The herbal notes from the rosemary and the lemon thyme just really sang with the gin, and the combination of citrus and herbals was inspired. This may be an avenue worthy of further experiments with homemade syrups as well -- maybe add more savory herbs to the citrus and other spices in the recipe and see what happens. Another important thing to note is that this was a head-to-head test, designed to highlight relatively small differences in the various tonics, in narrow categories. While most tonics that we tasted would beat a G&T put together by an indifferent bartender with well gin and tonic off the soda gun, the best Gin & Tonic is generally the one that happens to be currently in your hand, whatever the circumstances. For instance, Tomr's Tonic scored third out of four in its category in our tasting, but the Beefeater and tonic that brand proprietor Tom Richter mixed me at the Beagle was by far the best Gin & Tonic that I've ever had at a bar. The high-quality tonic syrup helped in that, for sure, but Tom's good-humored attention, concentration in his approach to the task, and passion for his work all translated directly to what I tasted in the glass. And, that attention and care can pay off for your gin and tonics at home. Wow! Neat, that's an exhaustive rundown! Saving for future reference. Nice writeup on tonics. If I'm going on the more inexpensive end, I find Schweppes, Canada Dry and Polar almost to be interchangeably acceptable. Have you been able to try some of the Liber & Co or Jack Rudy Cocktail Co. tonic syrups? There's an impressive amount of range among them right now. I find that a lot of the ones I prefer seem to be not far off the Morganthaler formula for homemade tonic. great read, here at Gin & Tonic Friday we will we be on the hunt for some Fever Tree Mediterranean Tonic Water.